The Baltimore Sun is reporting that Richard Oles, a well-known 77-year-old Baltimore fencing instructor who once coached at The John Carroll School in Bel Air, was struck and killed by a truck with a snow plow early this morning. The vehicle’s driver left the scene of the accident, according to The Sun. Just over a year ago, I profiled Mr. Oles for a senior section in The Catholic Review. He was an unforgettable character – a bit on the gruff side and wholly committed to sharing his love of swordplay. Below is my 2009 story on Mr. Oles. May he rest in peace. Richard Oles was walking around the campus of The Johns Hopkins University in Baltimore when his ears picked up precise, metallic clinking sounds emanating from one of the sports practice rooms. Intrigued, the college student peeked inside and was even more amazed by what he saw. Long a fan of Errol Flynn and other swashbucklers from the movies, Oles decided to join the team. It wouldn’t take long before he more than matched the skills of the swordsmen of the silver screen. Oles won numerous state championships and was a member of the USA Masters’ team that won the World Masters’ Championship in London in 1970. He was the legendary coach of the Hopkins’ fencing team from 1960-2003, renowned for taking men with no fencing background and transforming them into top-notch competitors. Now retired from Hopkins, the senior fencer doesn’t seem to have slowed down much. He heads the Tri-Weapon Club, the only fencing club in the Baltimore-Washington-Annapolis area designed for boys rather than adults. He also works with adults in the Salle Palasz program. Sitting in his North Baltimore practice facility, located in the lower level of the Knights of Columbus Hall on Homeland Avenue, Oles relished his role as a coach. Having the opportunity to teach young people to fence is more than giving them sports skills, he said. It’s also about helping them cultivate discipline and character. Concentration is the most important skill in fencing, according to Oles, who grew up in St. William of York parish in Baltimore and graduated from Loyola Blakefield in Towson. 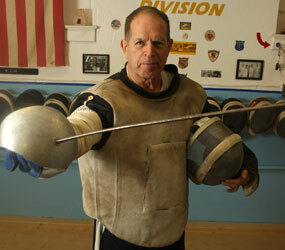 Oles specializes in all three of his sport’s weapons: foil, épée and sabre. Each weapon is suited to a different personality, he said. Before a new student picks up any of the weapons, Oles administers a questionnaire to match the personality with the weapon. The sabre, which a fencer may use to stab and slash to score points, is attractive to an aggressive personality, Oles said. The épée, a dueling sword used to score points by simply touching an opponent’s body, is a more suited to a person who can demonstrate patience. The foil is used to score point by hitting the torso. Students wear protective gear and an electronic device that lights up a scoring bulb when a hit is made. To be successful in the sport, a person has to “hang with it,” Oles said. Those who have done just that have gone far. The Tri-Weapon Club has produced three national under-16 champions. Three of the top four places in the 1993 U.S. national sabre championship were claimed by club graduates – two of whom fenced on the 1988 and 1992 Olympic teams. “The kids nowadays have so many things to do, they try it for six weeks or so and quit,” Oles lamented.